A couple of the scum have been working with Mandurah Council (who are very skate friendly!) and are running some comps. First one this weekend so get along and support if you can. Antoni will be at the Falcon Skate Park between 5-6pm and Billy Bowler Skate Park (Halls Head) between 6:30-7:30pm on Fri 28 Jan and Sat 29 Jan to take registrations. If you are under 18, you’ll need to have your parent/guardian there to sign your form. Entry fees are $10 per competition, or $20 to enter all three. Registration fees need to be paid in cash (unfortunately we don’t have an EFTPOS machine to plug into a tree!). If you aren’t able to pre-register Fri or Sat, turn up at 3:30pm on Sunday 30 Jan at the Billy Bowler Skate Park to register and pay the fee - just keep in mind that you’ll need your parent/guardian there to sign for you! With a free sausage sizzle, some friendly judges and MCs and good vibes, this Saturday’s first event is set to be a good one - hope to see you there! Unfortunately due to a Cat 1 cyclone forecast to hit the coast on Sunday this event has been pushed back to 6th Feb (next Sunday). once again thanks to tony , vic and daz for there comitment and extremely hard work. Unfortunately this seems to be the state of play these days. At the shed in Melbourne, I am not joking when I say there were half a dozen skaters and literally 200 scooters on a Monday arvo open session. Sorry I missed the post on re-scheduling. Wasn't aware this was on. Good work guys. 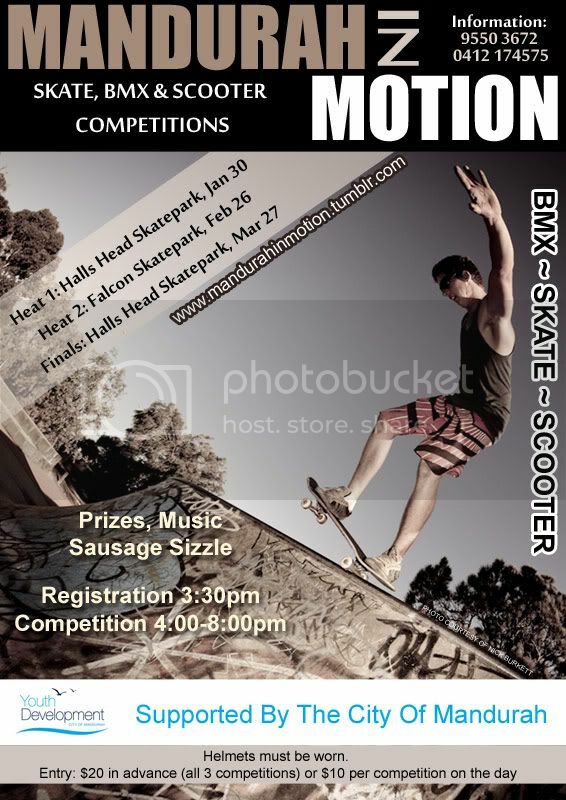 Final Mandurah skate/bmx comp this Sunday. Some cool prizes up for grabs, tunes and a barbie. Starts at 3.30. Why would you go anywhere else.